"Padmaavat", starring Deepika Padukone, Ranveer Singh and Shahid Kapoor, is all set to touch the 150 crore mark at the box office. The much-awaited film released last Thursday and within six days, "Padmaavat" earned Rs. 143 crore, trade analyst Taran Adarsh reports. Over the weekdays, the film collected Rs. 29 crore (On Monday, the collections were Rs. 15 crore and on Tuesday, "Padmaavat" earned Rs. 14 crore). 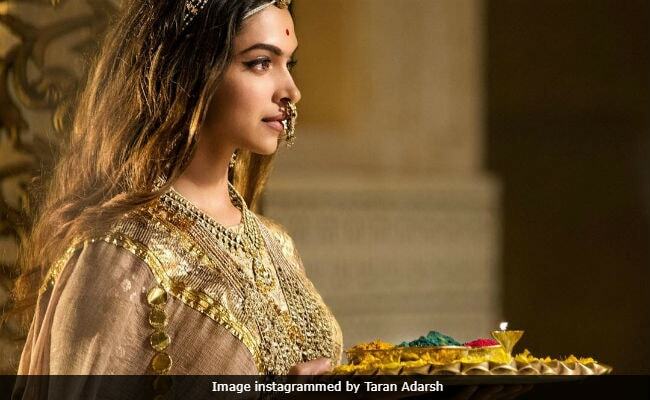 "Padmaavat"shows no signs of slowing down...SUPER-STRONG on weekdays," Taran Adarsh tweeted. "Padmaavat", directed by Sanjay Leela Bhansali, stars Deepika Padukone as Rani Padmini of Chittor, who had performed jauhar after Alauddin Khiji invaded her fort. Ranveer Singh plays Khilji in the film and Shahid Kapoor stars as Maharawal Ratan Singh, Rani Padmini's husband. Here's what Taran Adarsh tweeted about "Padmaavat". #Padmaavat shows no signs of slowing down... Biz is SUPER-STRONG on weekdays... Wed [limited previews] 5 cr, Thu 19 cr, Fri 32 cr, Sat 27 cr, Sun 31 cr, Mon 15 cr, Tue 14 cr. Total: 143 cr. India biz. Overseas opening weekend: approx $ 12 million [76.24 cr]. OUTSTANDING! Trade analyst Taran Adarsh earlier reported that "Padmaavat", in its opening weekend, crossed the business of films likeDilwale, Sultan, Tiger Zinda Hai (which is still running) and Bajrangi Bhaijaan. (The last three films star Salman Khan). Also, Mr Adarsh mentioned that "Padmaavat" has surpassed the collections of Deepika and Ranveer's 2013 film Bajirao Mastani, also directed by Sanjay Leela Bhansali. In his review for NDTV, film critic Saibal Chatterjee praised Ranveer's performance and wrote, "The director's most willing ally in this endeavour is Ranveer Singh, ebulliently evil and visceral in his portrayal of a venal villain on the rampage. He is never short on energy." Deepika Padukone's "Padmaavat" released after a month's delay. It was earlier scheduled to hit the screens on December 1. Several Rajput groups protested against the film. The CBFC gave a green signal to the release earlier in January and suggested five modifications, including the title (which earlier was Padmavati).